Measure the gravitational constant G in a single lab period. This device will impress your students in a way no textbook or even video can match. 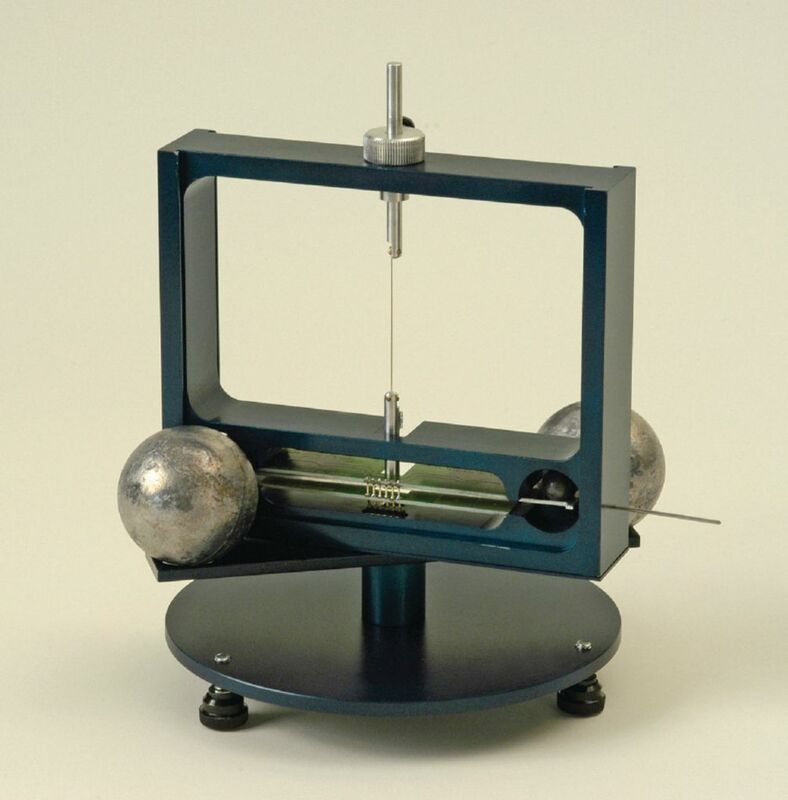 The Cavendish Unit is essentially a torsion pendulum in which two 15g lead balls on the end of a lightweight aluminum “boom” is suspended in the center by a 25 micron diameter adjustable length tungsten wire. The typical period is 2–4 minutes. This boom is mounted inside an aluminum draft-proof case that allows a pair of 1 kg lead balls, acting as the attracting masses, to be swiveled. Additionally, the boom is suspended between the capacitor plates of the SDC transducer, which is mounted in the aluminum case. The transducer also features two sensors to eliminate noise due to pendulous motion. With a resolution on the order of 25 microradians, the transducer output is proportional to the angular movement of the boom. This unique and patented transducer design measures only the rotational motion and minimizes the unwanted pendulous component of motion. A small mirror is mounted on the boom for calibrating the unit and for measurements when you want to use an optical lever arrangement. Software is included with each Computerized Cavendish Balance allowing you to save data, export it to a spreadsheet for further analysis, or share results with other classes. An included USB cable is connected to an IBM compatible computer for collecting data in either a continuous or single pass mode at rates of 10, 5, 2, 1, or 0.5 samples/second. The number of data points displayed varies from 512 up to 32,768. The unit comes complete with four lead balls, a calibration pin, five feet of extra 25μm tungsten wire, a manual which describes how to use the unit, and software, with instructions, for collecting data. Size: 37.5 x 37.5 x 37.5cm; weight: 23 lbs.